Militants Shot Down Syrian Air Force Helicopter Near Beit Jinn (Photo, Video) 1.625 out of 5 based on 16 ratings. 16 user reviews. UPDATE 2: The militants have released a video with the downed helicopter. UPDATE: Pro-government sources say that the helicopter crashed because of a technical failure. The joint forces of Hayat Tahrir al-Sham (formerly Jabhat al-Nusra, the Syrian branch of al-Qaeda) have reportedly downed a helicopter of the Syrian Arab Air Force in the Beit Jinn pocket in southern Syria. Accordign to reports, the incident took place southeast of the village of Khan ash-Shih. How did they get MANPADs? have you some article talking manpads, theres no mention of them here. so anything between stones and manpads is unable to damage helicopters? have you missed the hundreds of technicals with guns ranging from 12.7 to 23mm used by ragheads? You trolls are getting pathetically aggressive on the most unrelevant subjects. For me and most of the regular users here, it’s a joy seeing you sinking in that swamp. 23 mm API-I rounds to the engine area will cause heavy damage and fires. The helicopter is armored only around the cockpit. There have been instances of hinds also shot down by NSV 12.7mm HMG and KPV 14.5mm. I expect people on sf to understand that it’s a robust helicopter, not a tank – certain stereotypes are good for hollywood but don’t belong in sites doing serious analysis. just a guy that loves the truth and is disgusted by trickstaz. I know, it’s a bad time to be around for people like me. From just over the border, the occupying force of the Golan Heights, I presume. Jewhadi will be vanished soon in whole Syria and Iraq then Syrian and Iraqi nations will be free to eliminate all migrant Israeli refugees from whole Middle East to liberate Palestine from these Israeli terrorists. This is a matter of time you will see yourself. God helps those who help themselves. I have seen the Muslim strength and intention in the region. If only Iran just do pee towards Israel then whole Israel will be drowned in the Mediterranean sea. Do not worry. If Israël goes down in another genocide, they will take the whole region with them, including all Palestinians. It does look like a technical failure rather than a rocket impact, wouldn’t the chopper blow up in pieces if it was hit by an anti-air weapon? no, but in any case the evidence is suspicious. Firstly, the first pic is of a Mi-8 Hip while the vid shows a Mi-24 Hind. secondly, the video is suspiciously lacking a whole part, the one that would show the helicopter actually crashing to the ground. There is no way to tell that the filmed crash is actually that of the Hind which is shown flying with an engine fire. We’ve seen this kind of dirt-cheap lying coming from jihadists sources since the beginning, there are few doubts that they are bullshitting in this news too. Exactly. 0:40 something exploded but you can’t see what… interesting they removed everything before that exact moment. nothing is seen exploding at 0:40. It’s just the moment the scene switches. My impression is that the average russian helicopter can run on tinned spinach and you could throw a small dog in the running engine without crashing it. The video seems to show a helicopter in controlled flight returning to “friendly” territory for a very quick smoke break. assault helicopters are robust by redundancy. a mi-24 with an engine destroyed will get back with power from the other engine. in general, the impression you speak about is typically generated by 50 years of pentagon rubbish like “Soviet hardware is sturdy and unsophisticated”. Even parrots will tell you that. Indded. The helicopter is flying in controlled flight, with no signs of significant explosive damage. It is also flying in a clear blue sky. The video cuts to show something having crashed into the ground – on a cloudy / hazy day. One of the comments says the video is from 4 November 2016. My guess is the terrorists have spliced an earlier filmed crash onto the end of a video of Mi24 experiencing technical difficulties. Right on no sign of a hit on anything. Closing frames and black smoke -especially in the last two seconds looks like a hit. This report seems cobbled together. A chopper was downed but how and why remains two separate stories. Just imagine the panic and the crash of airline stocks . Nah their security apparatus can foil such plan 9 out of 10 of the time. What we’re seeing happening much were state allowed terrorism or false flags. Feeding rabid dogs is never very sensible. I detest flying Matt, so I care little. Have done for years due to the crap at the airports. Citizens have a choice, fly or don’t fly and when the terrorist Manpads arrive in Europe and the US, I suspect few will fly. The worlds terror groups obviously realise they have this demonic power that is greatly enhanced by their suicide bomber philosophy. Its just a matter of ‘when’ this jihad against civilian aircraft begins in Europe as it surely will in my opinion. Why the video shows a Mi-24 while the pic shows a Mi-8? 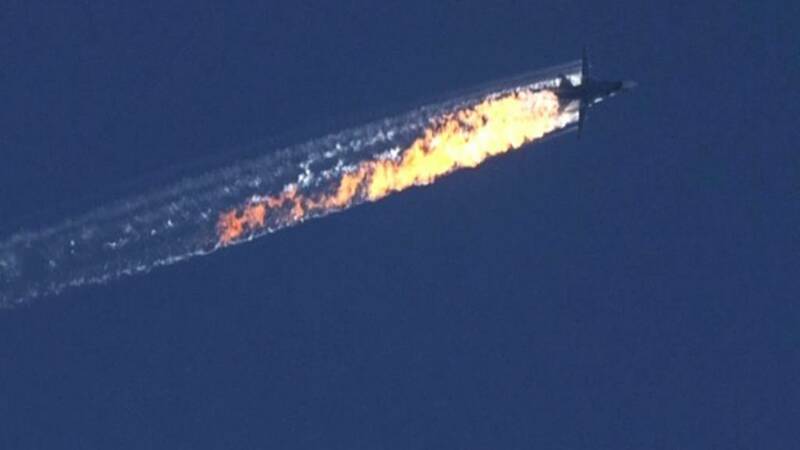 When the Russian jet from Egypt was destroyed by an altitude bomb, the terrorists posted footage of this on DAY ONE. Putin denied it was a terrorist attack for weeks. It is standard operating procedure, 1984 police-state style, for both the West and Russia to deny (ie., lie) about enemy ‘spectaculars’- as if the internet doesn’t exist. This is the training officials got in the middle of the 20th century, and they still follow the same propaganda rules today. The real story is that the British SAS, and others, train, arm and lead the terror gangs in Syria. The only limit to their operations is fear of blow-back if they go ‘too far’. Syria will be cursed by British backed terror sleeper cells for decades to come. They won’t retake much of Syria, but they will degrade the lives of ordianry Syrians- the punishment Britain seeks to impose on Syria for daring to have defeated the wahhabi invasion. Turks shot Su 24 down. …hunted it /planned attack on previous opp route near Turk border. One side is control, ….the other plays catch up. Syria Now occupied with no UN protection. …..Putin will not turn S 400 on or give Syria comparable. Result. ….Syria will be fought over like a messy divorce in court. Turkish convoy is destroyed by airstrikes at border passing. you stank trolls always like to forget this. Netanyahu with wealth and prizes. while trolling ruffians remain empty handed like always. You are probably some 40 IQ Zombies hero ….for dumping on me …with your crass insults. .
And they will connect the dots! ! He’s a placement*…after the Atlanticist loot Russia 6 ways from Sunday. Oligarch Jew know what. ..everywhere on the periphery. Putin is collusion with how many since rusty old smoking carrier limped into Syrian waters. Erdogan. ..Obama, Hitlery Clinton, Poroshenko, Saudi Flunkies, ….Trump. Some posters said Putin can’t shoot down IAF or US jets or its WW 3. Russia/Putin has amazing C4I with radar/jamming/burn thru that can zero out US /Nato and Israel at the press if a button. And nobody on the planet has anything goes to keep up with that!! you expected me to get personal, which i did not (“while trolling ruffians remain empty handed like always”). Unless of course you are admitting you’re a ziotroll. so you wrote your comment before i did even respond to the former, then pasted it anyway. If I score 40 iq, you score 10. In the real world, state officials acknowledge about terror acts AFTER a proper investigation is completed. That’s what happen in the real world. Elsewhere, geopolitics are made out of pandering and trolling. President Putin did NOT instantly deny it was a terror attack . What he did say though was that he would not apportion blame until an investigation had been made. This is the correct way to behave. USA-Israel-NATO MANPADs in action ! What is Russia going to do about that ? One bunch of fascist pigs at a time puhleease. Seems SAA is losing much hardware these days. This will make many happy to hear.